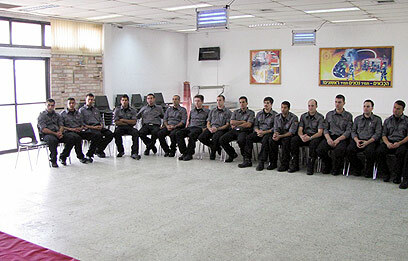 Six members of the Druze community will be stationed as firefighters in Judea and Samaria stations on Sunday, along with 18 other graduates of a firefighters' course. The graduates will be stationed in Ariel, Beitar Illit, Gush Etzion and Modiin Elite, making them the first Druze firefighters in that region. The course graduates received their certificates from the National Firefighting and Rescue School in Rishon Lezion on Thursday evening. Deputy Minister for the Development of the Negev and the Galilee Ayoob Kara, who helped promote the program at the Knesset, said it was an important day not only for the Druze community, but for the State of Israel. "If there are Druze major-generals, pilots and police commanders, there can definitely be firefighters from the community," the deputy minister said. "It's time for us to work for equality not just on the demagogic level, but on the practical level as well. Integrating minorities into the employment market is critical for maintaining the State's democratic identity and for providing equal opportunities." According to the Firefighters Union, the addition of firemen was needed due to manpower shortage. "It's an unprecedented move having 24 new firemen are join the Judea and Samaria and Jordan Valley union," said Major Jacky Binyamini. "The new firemen will double the union's power, as some of its stations have only one firefighter per shift." Binyamini stressed that the move was initiated by Deputy Minister Kara and the union's commander, Captain Amnon Amir. "We warmly welcome the addition of the Druze firefighters to the union and hope to continue employing firemen from the Druze sector," he said. See all talkbacks "Druze to put out fires in Judea and Samaria "